Classroom-tested and teacher-approved, these activities help children ages 3-6 learn all about numbers. With 100 engaging and fun activities, Learn Every Day About Numbers offers everything a teacher needs to build a foundation for future math learning. Children will love becoming a Number Detective, a Flashlight Writer, or a Number Hero as they investigate the wonderful world of numbers. Each activity offers learning objectives to meet standards, a materials list, related children’s books, and an assessment component to measure children’s learning. 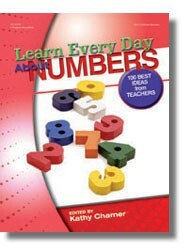 Learn Every Day About Numbers is sure to become a classroom favorite!